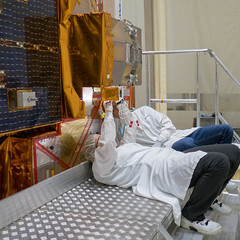 Following its arrival at Europe’s spaceport in Kourou, French Guiana, on 29 June, the Aeolus satellite has been taken out from its transport container, placed on its integration trolley for testing and connected to its electrical support equipment. Initial checks indicate that both Aeolus and its instrument have withstood its journey from France in good condition. The team has also done the ‘ launch adapter fit check’, which is to make sure that the satellite actually fits the Vega rocket adapter and confirms that everything is aligned. This too went well. Cranes were then used to position Aeolus back on its integration stand. It hasn’t been all work work work for the team though. Some of them managed to get a quick look at the launch site: the Aeolus flag, the Ariane 5 rocket moving on the launch pad and the Soyuz launch pad.